It’s fair to say that everybody knows that data is an important component for success in todays world. We may not know how much value it has, how to value it, or even what data we have, but we do have that overall sense that it is important. Sports is one area where the impact of data is immediately visible to all. From data devices on the backs of rugby players to the use of hawkeye to the insane stats that flash up on TV screens during a game. Data has also been used in the strategic management of sports clubs and their performance, to which Liverpool F.C. are no strangers. The reason for singling out Liverpool is entirely personal as I have followed them for as long as I can remember. Like most clubs, Liverpool has its ups and downs but recently fans have solid grounds to be more optimistic with the appointment of Jurgen Klopp, who has brought his attacking style of play (called “gegenpressing“) to the Premier League. They are also an interesting case from a data perspective as following the acquisition by Fenway Sports Group (FSG), they were the first Premier League team to use the concept of sabermetrics. A concept made popular by the movie Moneyball (based on a book by Michael Lewis’s) which was applied first by the Oakland A’s baseball team with great success and later brought to the FSG owned Boston Redsox. Unfortunately, the method did not work as well in the Premier League. It doesn’t take a Data Scientist (or any other Jonah Hill equivalent) to notice something is gone awry when an algorithm advises you to buy Andy Carroll for £35 million. The key message here is that as complex and brilliant as data science can get, it can still benefit from understanding the basics of sport and life. One such principle is balancing defensive and offensive capabilities. Defence and offence is a fundamental concept in sports, if not the most fundamental aspect. Teams and pundits alike are obsessed with analysing aspects such as sports strategies, team performance and future directions using the frame of defence and offence. We see it in our own national sports, where a lot of attention is given to the defensive makeup of gaelic football teams giving rise to “puke football” and a new defensive sweeper role in hurling. Teams map out defensive and offensive zones in playing arena’s, they have separate coaches for each zone, they have specific roles within teams to carry out detailed defensive/offensive tasks during a game and they measure the effectiveness of both sides using different metrics. However, with defence v offence being such a well known concept in managing sports teams, it is interesting that is has only been very recently applied to managing data capabilities. An article in Harvard Business Review in 2017 by Leandro DalleMule and Thomas H. Davenport outlined the need for organisations to balance both their defensive and offensive data strategies. In the article it details a defensive strategy as one that focuses on control, good data quality and a single version of the truth. On the other hand an offensive strategy is one that emphasises flexibility and the ability to deliver different views (e.g. a marketing view, an operations view) depending on the needs of the business. 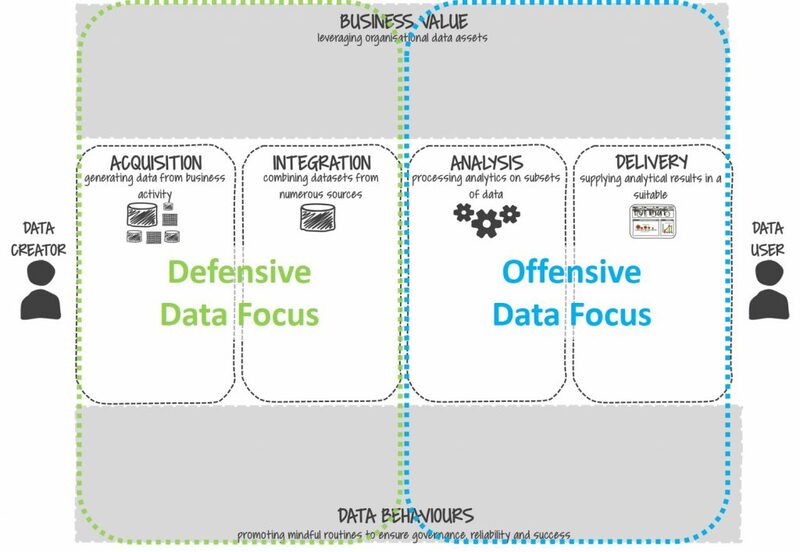 To visualise defensive and offensive data capabilities I have taken the Data Value map (http://datavaluemap.com), which in some respects can be use to represent a playing pitch and outlines the areas that a data defence and data offence focus on. In data terms, poor data quality and having data scattered in all corners of the organisation are the biggest causes of a leaky defence. You may be familiar with the feeling that while you have loads of data, very little of it is usable. This is a common symptom of a poor defensive capability. With regard to offence, many ogranisations have invested in advanced analytical technologies, which can deliver fantastic insights into the business. However, without fully understanding what the organisations needs, this investment may be under utilised or poorly focused. In addition, striking the balance between defence and offence is of paramount importance. If you favour an all out attack type strategy at the expense of your defence, you may end up with nice visualisations that present inaccurate data and poor decisions. Lastly, if you are intending to make data apart of your competitive advantage, you cannot afford to have weaknesses in your defence no matter what way it is balanced. This is something Jurgen Klopp is fully aware as Liverpool just missed out on the Champions League this year (#KeeperWanted). Weaknesses get exposed very quickly when the stakes are high and with the business world facing up to increased scrutiny through GDPR, organisations need to start focusing on their data defence to provide a stable foundation for success.